Michael Rodriguez trained as an opera singer in Stetson’s School of Music, and even studied French and German to help him perform in opera theater productions. 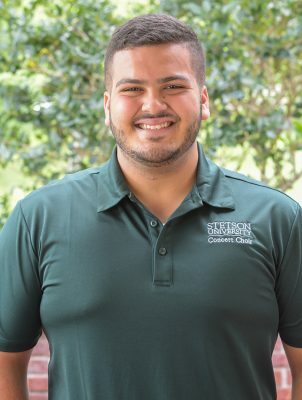 A month after graduating from Stetson, the talented tenor has accepted a job as a mechanical engineer for an aerospace company back home in Miami. It may sound like an unlikely career path for a music major, but Rodriguez earned a Bachelor of Music with an Outside Field in Physics. Michael followed in his brothers’ footsteps when he enrolled in Stetson’s School of Music. The three Rodriguez brothers have sung together since they were little boys and their mother dressed them in matching outfits to perform for family and friends in their living room. 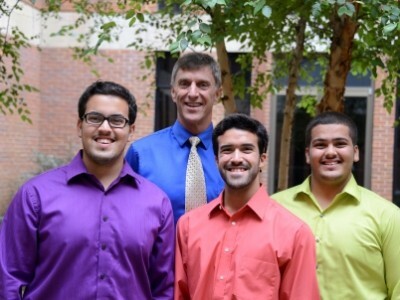 The three Rodriguez brothers (from left), Manny, Brian and Michael, take a break in 2014 with Craig Maddox, D.M., associate professor of voice. In addition to pursuing their passion for music and performance, each brother gravitated toward other disciplines, including finance, business and physics. Eldest brother Brian received a Bachelor of Music with an Outside Field in Business and then earned an M.B.A. from Stetson. Middle brother Manny graduated with a Finance degree and a minor in Music. The two older brothers went on to perform for a cruise line, and Brian now is assistant cruise director for Viking Cruises. They also joined Michael for the last song of his Senior Recital — “Granada” by Agustín Lara — in Lee Chapel in April 2018, below. Michael credits Stetson for providing him with so many opportunities during his undergraduate years. In addition to being a member of the Stetson Opera Theatre program, he sang in the Concert Choir and toured Florida and the East Coast each year during Spring Break or at the start of summer. The schedule required many rehearsals and performances, and his professors, especially Physics Professor George Glander, Ph.D., were very understanding in allowing him to take off time and still complete his coursework. During tours with the Concert Choir, he went white-water rafting in West Virginia and saw the Appalachian and Smoky mountains for the first time. Michael also was selected last year as one of 12 students from the School of Music to travel to Germany and London for 12 days to study the sacred music of composers Johann Sebastian Bach and George Frideric Handel. All expenses were covered, except for a few meals, and the students made a stop in Iceland on the way home. 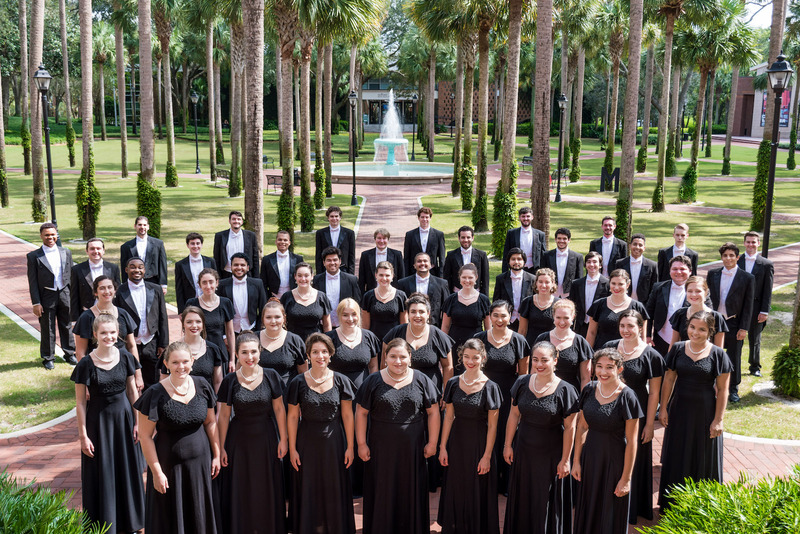 Tenor Michael Rodriguez, in the middle, third row from the back, sang with the Concert Choir throughout his time at Stetson. Photo taken October 2017 in Palm Court.